Van Blobs—I want to create an entire language using only the name of this band. Conversations would go like “Blob blob blub blob” I am having fun already! I will spare you any more of my secret language for now. Apparently people get a little uneasy if you use your own made up words. Lets instead talk about a language we can all understand. MUSIC! Van Blobs makes charming indie bedroom pop. On their latest single they kindly ask us “not to kill their vibe”. I wonder what the family had to say. Listen below and read on to find out. Van Blobs worked quickly to put a smile on my face with this one. “Please Don’t Kill My Vibe” gave me throwback vibes to some early 2000’s playlists of mine. Regina Spektor and Kate Nash came to mind, though she isn’t so heavy on the piano like them the energy just reminded me of it. Her vocal style is familiar, though I can’t place it. It’s sweet, soft, and raw...like your favorite childhood candy. I particularly loved the surfy riff in that comes in at about 1:10 and lingers in the background. “I’m tired of saying ‘I’m sorry out loud.” Don’t we all feel like that as we get older? I like the lyrics here, though every time I tried to look them up I got redirected to a Kendrick Lamar song. If you’re like me, and can’t wait for warmer days here on the East Coast, do yourself a favor and throw this Van Blobs diddy into your next playlist. It will have you feeling like the warm sun is breaking through those winter clouds. The Van Blobs didn’t kill my vibe. This track seems to have everything. The music is pleasant and the vocals seem to flow effortlessly. I like the way this track opens with the vocals only and then a soft guitar comes in. The refrain, "please don't kill my vibe” is very catchy. The xylophone at the end is a very nice touch. Bravo! We need more Van Blobs in this crazy world. Refreshingly simple is the phrase that keeps coming to my mind. 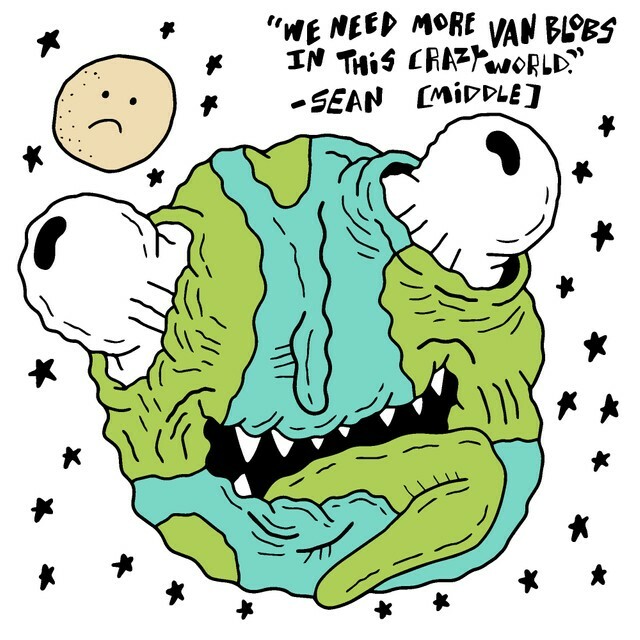 Van Blobs’s first release is close to three minutes long, but It never felt longer than thirty seconds. I can say this with confidence because I must have listened to the song a hundred times over while writing this review. Okay so maybe that means I am just a really slow writer. At any rate, during no time while writing did I ever get tired on this tune. The song puts out a clear message. That message being when you are pursuing a creative field a lot of people are going to encourage you to give up. They will tell you to either give up or lower the bar. It is a struggle that a lot of creative people unfortunately have to deal with. It is a really tough struggle, but at the end of the day, whether it is sustainable or not, I would advise people to do what makes them happy. Okay, long segway about the message aside the music on this album is crisp, and carefully organized. I can only hope that nobody kills their vibe, and they continue to put out beautiful tunes like this. Also, short after note: If you have not checked out their Instagram page already I advise you to do so. It is incredible. I want to live inside Van Blob's rose-tinted pastel world. I imagine there's a lot of cupcakes. With the twinkling guitar, punchy drum kick, and some adorable vocals, this is the soundtrack for a walk through Washington Square Park on a perfect spring day; the birds are chirping, the sun is finally out, and there's no abandoned poo in sight. Something about the vocals and the bouncy beat gives off a Corinne Bailey Rae vibe. It's the kind of song that instantly lifts your spirits, charms you, and slaps a stupid smile on your face. I listened to this track once, and now I have a stupid smile on my face. What’s most compelling is it’s naivety; it never feels twee or too "young." It just feels pure and genuine, while the lyrics have this sort of tongue-in-cheek maturity that feels playful and poignant and the same time. I kept hitting replay because I didn't want it to end. So, if you see me smiling like an idiot any time soon, you'll know why. Now this is some good stuff. I love her sound and how the song makes me feel. Its a chill, catchy tune that I will continue to listen to over and over again. “Please Don’t Kill My Vibe” fits perfectly with the cafe I’m in. For some reason this is not what I was expecting. Just from the title, I figured it was going to be some lame Kendrick Lemar remix. But boiiiiiii was I wrong. This couldn’t be more different. Some good alternative, pop music that I cant see myself not listening to more in the future. Great stuff.